Yesterday was the final WNCF/H Guild meeting of the year. In addition to officer elections, this was also when our towel exchange took place. 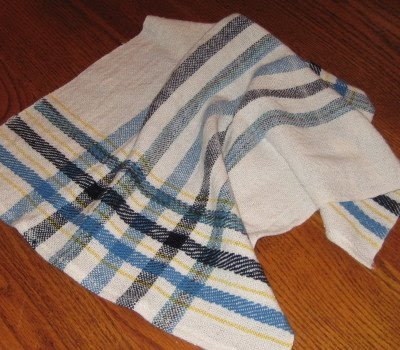 You may recall the waffle weave dishtowels I wove for that. 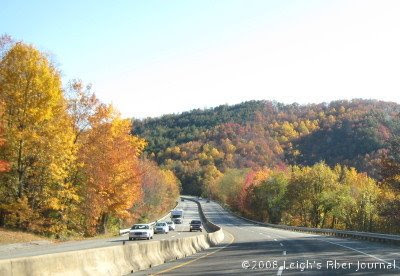 But before I tell you about that, I'd like to backtrack to show you the drive up the mountain to the meeting. Even though it's a little late in the autumn color season, it was still a real treat. The exchange took place after the business meeting and program. There were 18 participants. By drawing numbers, we traded for as many towels as we brought. In addition, each participant received a project sheet from each towel weaver. I was very pleased with the towels I received. They are exactly my colors! 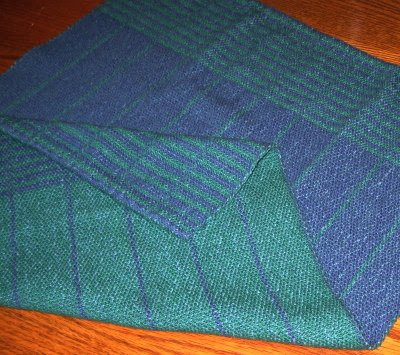 This one is a plain weave with twill weft stripes, woven by Bobby Payne. And this one is a warp faced compound tabby woven by Lynda Feldman. This was the first exchange I've participated in. Besides two lovely new towels, I am also delighted to have a project book with so many ideas and samples. Definitely a welcome resource. 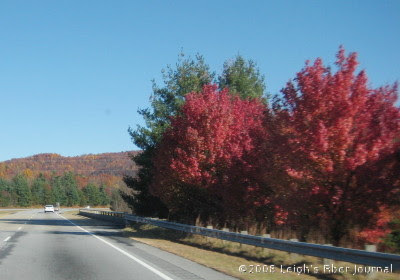 The pics are so pretty... remind me of driving along HWY 15 in KY.
Those towels are so pretty! They're in my colors too. the pictures from your drive are also quite lovely. There are so many different ways to handle the actual exchange. My guild is planning something similar for next spring. Could you please explain in better detail how the drawing/dispersal process was handled by your guild and if everyone went home happy? Perfect for mopping your brow after committee meetings!! Here's to the 2009 president-elect. 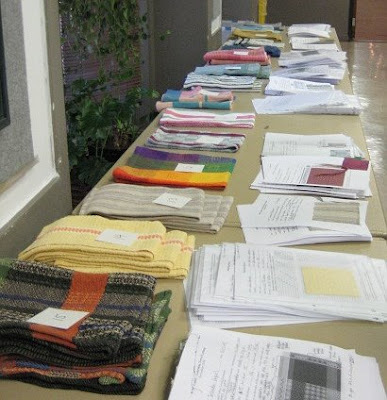 How wonderful to have 18 weavers participating in an exchange, to have laid out on a table the results of 18 different approaches to weaving towels! This is a Guild to be proud of, many congratulations to the new president for 2009. You certainly live in a beautiful area. The towels you received in your exchange are fantastic!!!! Having guild exchanges is so much fun. Congratulations on being elected president. Steph, welcome to the wonderful world of weaving! Thank you for leaving a comment. I hope I can serve as a source of encouragement for you. Barbara, I'm happy to tell you how we handled the exchange. As I mentioned, everyone brought as many towels as they wanted to trade. In the photo, you can see how everything was laid out. On each stack of towels is a number. Everyone took one project sheet from each stack, and then we drew numbers out of a bag for our towels. Afterward, anyone who wanted to swap was able to. We had 18 participate, so the numbers used were 1 - 18. I think the drawing would have been easier if there had been as many numbers to draw as towels. For example, if person #1 brought 2 towels, put two #1's in the bag (one for each of the towels they brought). If person #2 brought 3 towels, put in three #2's. That way each person would draw out as many numbered slips as they brought towels. Of course, if we drew our own number, we got to put it back and draw another. Does that make sense???? I appreciate everyone's congratulations. I've got some really good folks to work with, and an excellent guild to be a part of. Sounds like you had a good time and what nice towels you got. 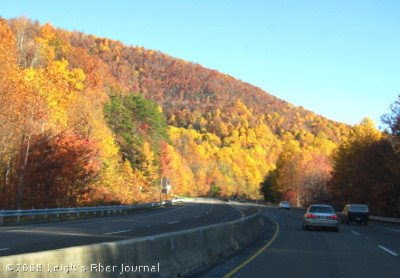 Fall is my favorite time of the year and it looks like you have beautiful colors there. What a beautiful drive - looks like driving south from here did a couple of weeks ago before we got rain, rain and more rain! Congrats on being elected pres of your guild. You are so organized, they surely are lucky to have you. And what beautiful new towels you got. What a fun event! T.
I want to be your neighbor, like right next door, only I don't want to live where you live and be all humid and stuff like that, in spite of it appearing that you live in a most gorgeous part of our country. So how do you feel about moving to Northern Nevada??? Those pictures are such an inspiration. Gorgeous gorgeous colours. Oh yum! I want to jump on a plane right away to see them! Towels very impressive too. What lovely towels! I know they are meant to be used and I'm always telling people to not be afraid of the things I knit for them. But I almost think I'd be afraid to sully those with my messy kitchen ways! And a big Congrats!!!! on your election as president of the Guild. That is wonderful!!! !